Successfully Added MOYEAH CPAP Ventilator - EPR, IPR, 3.5-Inch Display, Quiet Design, Integrated Air Humidifier, Data Management, SD Card Slot to your Shopping Cart. With the MOYEAH CPAP ventilator, everybody will be able to get a good night’s sleep. With its continuous positive airway pressure, this ventilator continuously applies a mild air pressure that will help a person breathe naturally at night. This health gadget is extremely useful for people that have breathing problems or suffer from sleeping apnea. CPAP ventilators can be used for personal usage as well as medical usage where it helps the patient breathe throughout the night – ensuring he’ll always get the proper amount of oxygen to rest comfortably. With its smart-start design, the MOYEAH CPAP ventilator starts working automatically when it detects a person breathing. When still awake, the machine applies a low air pressure that will help you to fall asleep naturally and fast. Once asleep, the air pressure will be increased to ensure you’ll always inhale the proper amount of oxygen. Thanks to its intelligent pressure release algorithm and EPR technology, the machine will apply less pressure when exhaling and more pressure while inhaling. This stimulates your natural breathing rhythm. Your CPAP ventilator comes with a 3.5-inch display that will automatically adjust its brightness based on the light in your environment. You’ll be able to slide in a 32GB SD card on which it will store the data obtained during your sleeping sessions. The machine furthermore lets you analyze and compare data over a 1 year time period. This allows you to look back at your breathing rhythms to see whether there has been any improvement during the past months. For extra comfort, this health gadget features a low-sound design and comes with a built-in air humidifier. Thanks to this, you can be guaranteed of a good night’s rest whenever you close your eyes. 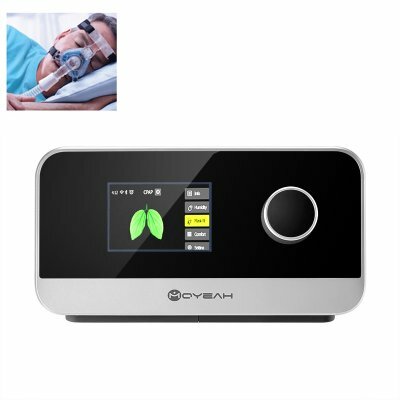 The MOYEAH CPAP ventilator comes with a 12 months warranty, brought to you by the leader in electronic devices as well as wholesale health and fitness gadgets..